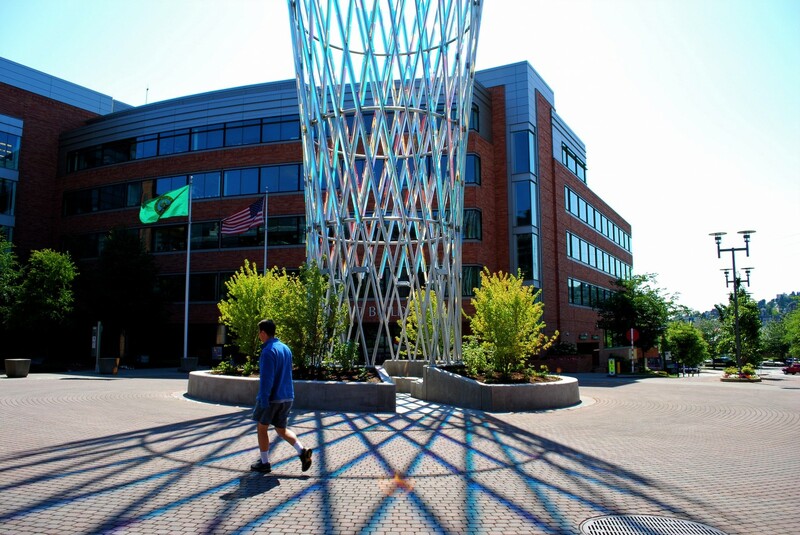 “Vessel”, completed in July 2008, is a centerpiece for the Fred Hutchinson Cancer Research Center. Rising more than four stories in a transparent and searching gesture, this monumental but delicate sculpture employs light to represent the optimistic spirit of the institution. It is a luminous container for the aspirations and hopes of all involved. By juxtaposing native plantings with crystalline structure, it suggests a variety of dualistic metaphors: natural and technological, intuitive and rational, transparent and opaque, formal and informal. This “basket of light” expresses the dynamism of the Center in the way light and shadows play off, through and around the combinations of materials. 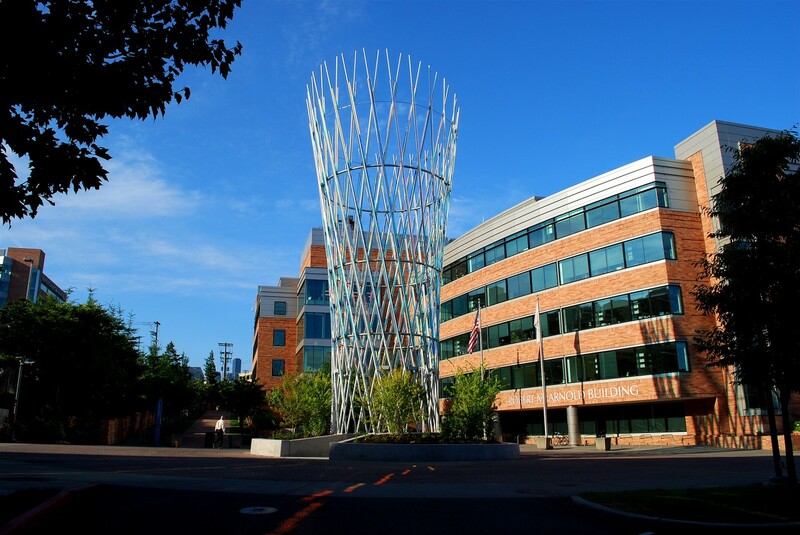 Its interwoven structure represents the interconnected and collaborative nature of the Hutchinson Center. 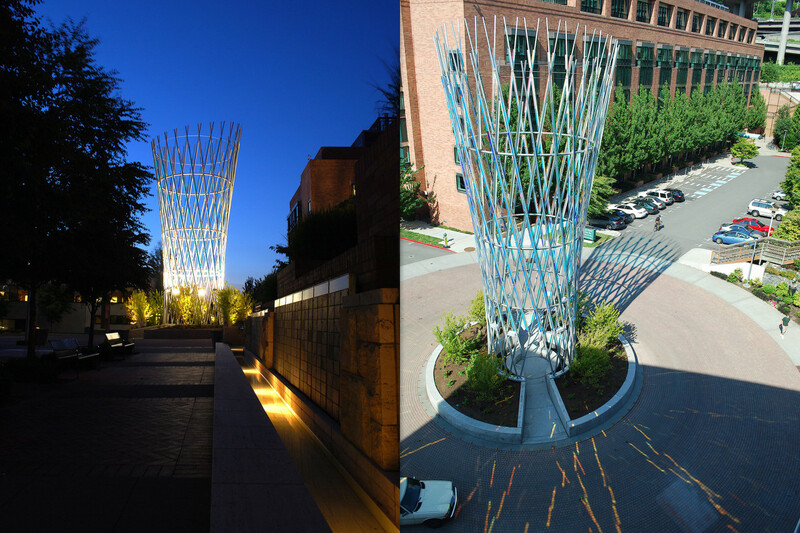 “Vessel” works on an urban scale, marking views along various axes, as well as on a human scale, allowing passage into and through the leafy core or the sculpture itself. As the vegetation surrounding “Vessel” matures and honeysuckle vines grow up its lattice structure, the interior space will be extraordinary for its delicate light and combination of intimacy and monumentality. 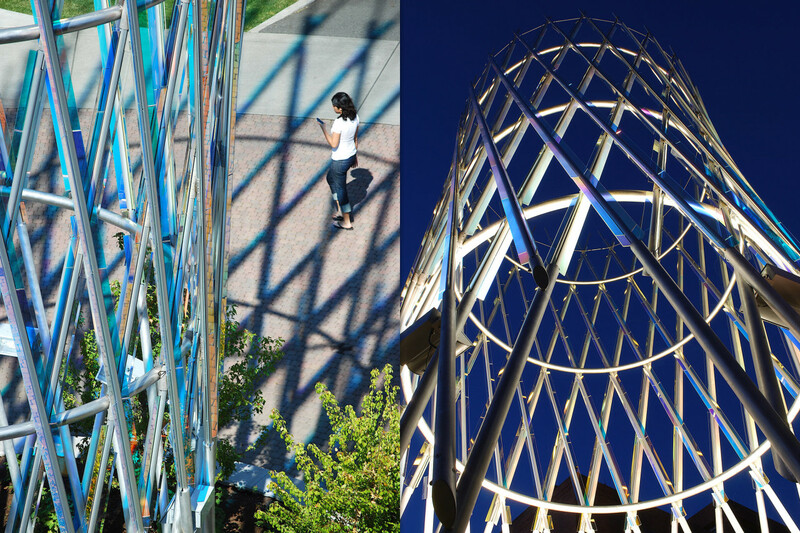 Hourly, daily, and seasonal changes in the light and vegetation will make the sculpture an abstract sundial as well as symbol of transformation. Its’ classic form, attractive materials, and hierarchy of scales will give “Vessel” universal appeal regardless of whether experienced from a passing car, adjacent building, or passage on foot through its center. “Vessel” faced a challenging structural issue in that the site requires a tall sculpture to address axial views and to be in scale with surrounding buildings, but there are serious weight restrictions due to the load limits of the tunnel structure beneath. This dilemma was addressed with a design that is lightweight in spite of its monumentality. 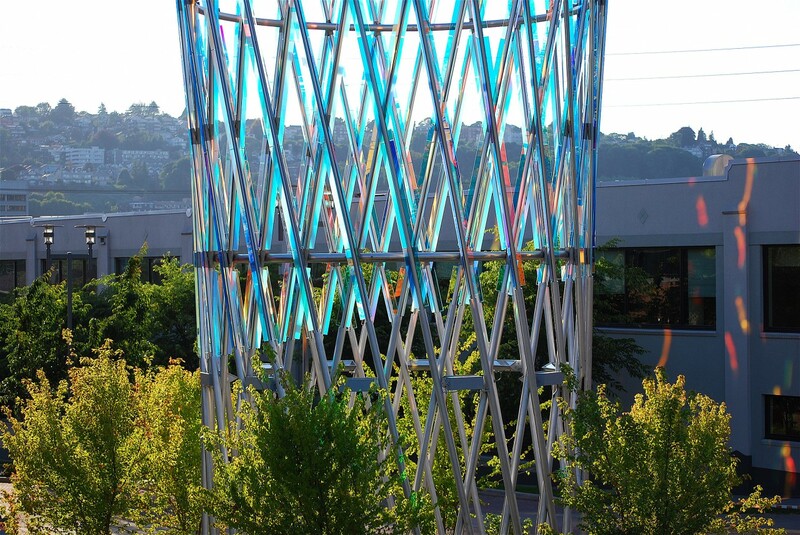 Employing aluminum, stainless steel, and slender strips of dichroic and beveled glass, the sculpture achieves both goals simultaneously. In an unusual innovation, laminated and tempered safety glasses were used structurally to strengthen the section of the aluminum members, allowing longer spans at lighter weight than with conventional methods. Date: Winning Competition Design: May 2006. Installation completion: July 2008. 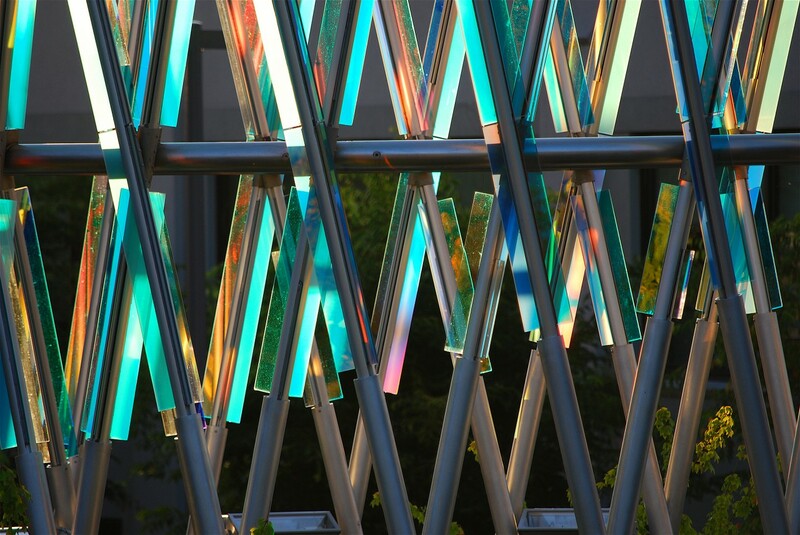 Materials: Aluminum, stainless steel, laminated dichroic glass, beveled clear plate glass, concrete, and landscape vegetation. Metal Fabrication and Erection: W.A. Botting Co.